BSI’s Trafficking and Supply Chain Slavery Index has found that China, which supplies 18 per cent of yearly construction materials to the UK, is the highest risk source of modern day slavery for Britain. Law firm Eversheds Sutherland has launched two e-learning modules, developed to train businesses to understand and manage their risks related to modern slavery. Last week Erwin and Krystian Markowski were each sentenced to six years in jail at Nottingham Crown Court after being convicted on charges related to trafficking people for labour exploitation. The UK is exposed to an increased risk of modern day slaves entering the country from two thirds of the countries of the world, according to new research from the British Standards Institution. Companies must step up their game to eradicate all traces of forced labour, David Noble, group CEO of the Chartered Institute of Procurement & Supply, said in response to claims by the BBC’s “Panorama” programme that child refugees in Turkey are making clothes for UK shops. 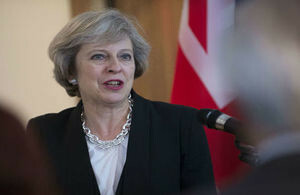 Prime Minister Theresa May has called for global action to stop modern slavery, and set up a new task force to tackle the issue. Look out for the latest issue of Logistics & Supply Chain – it’s available in print, and for iPad and Android. Small and medium sized businesses are unaware of the cascading impact the Modern Slavery Act has on them, the Chartered Institute of Procurement & Supply (CIPS) has said. UK businesses are woefully unprepared for the Modern Slavery Act’s reporting requirement despite the fact that the new rules come into force on 1st April, the Chartered Institute of Procurement & Supply has warned. Businesses with a year end of 31st March 2016 will be the first required to publish a statement on the action they have taken to ensure their supply chains are slavery free.